Leaders in politics, education, religion, business, and social services came together for Women’s Equality Day to speak about the voting power of women and immigrants and the importance of passing an immigration reform bill that supports women and their families. Speakers included Illinois State Senator Heather Steans; Julie Hamos, Director of the Illinois Department of Healthcare and Family Services, Rose Mary Bombela Tobias, Principal at the Global Diversity Solutions Group, LLC; Maria S. Pesqueira, President and CEO of Mujeres Latinas en Acción; Rabbi Alison Abrams, Director of Organizing, Jewish Council on Urban Affairs; and Maria and Rafael, immigrant mother and son. August 26th, Women’s Equality Day, marks the anniversary of the passage of the 19th amendment, which granted women the right to vote. Women have always been on the frontlines of fighting for inclusion, democracy and justice—from ending slavery, to winning the women’s right to vote, to the gains of the Civil Rights movement. Currently 75 percent of all immigrants living in the U.S. are women and children. 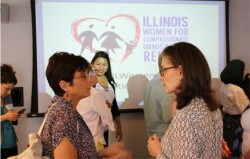 Immigrant women are faced with unique challenges, including workplace protection issues, domestic abuse problems, and family unity concerns. At the end of the event, the attendees signed a letter to the “Illinois Congressional Delegation,” which called for comprehensive immigration reform. Participants were given space at the bottom of the letter to voice their own opinions about the need for immigration reform.